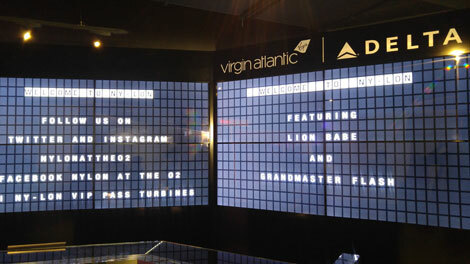 Virgin Atlantic and Delta Air Lines teamed up to open the NY-LON Lounge Bar at The O2 in London this summer, and Business Traveller Asia-Pacific was invited to join the launch party. The airlines partnered with Manchester-based design agency LOVE to create the 6,000 sq ft (557 sqm) bar in this aviation theme. 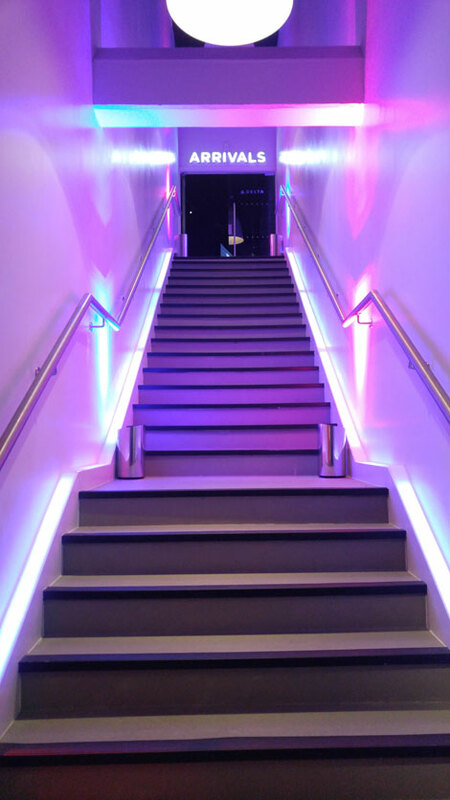 Upon arriving at the entrance, a long staircase takes you to the “Arrivals” level, where you are met with a large “flight notice board” and some words of welcome before being greeting by ‘stewardesses’ at the reception. The lounge bar can accommodate up to 400 guests, and is separated into two parts; the VIP Lounge located in front of the reception features four six-to-eight seater booths, while guests can reach the Turbine Lounge after passing through a tunnel adorned with airport codes from around the world. 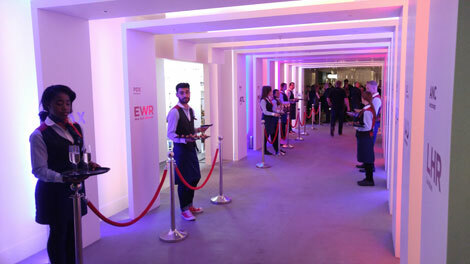 The bar is located on the left of the Turbine Lounge as you emerge from the tunnel. Fitting with its name, the semi-circular bar is designed to resemble a flight engine’s turbine, with each slice of turbine dominoed against the next with great effect, and topped off with sophisticated mood lighting. The bar itself can seat around 20 guests. 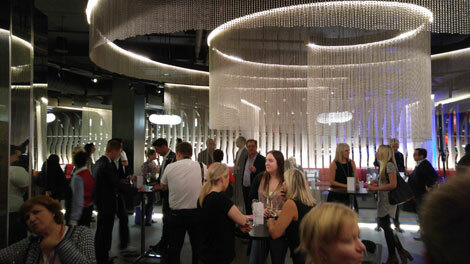 The central area of the bar was designed as an open area for the event, and ample cocktail tables were set in this space, making it easier to socialise. The space can also be transformed into a semi-private seating area. There are also large plum sofas placed around, offering a comfortable seating area for guests to enjoy different cocktails and food. 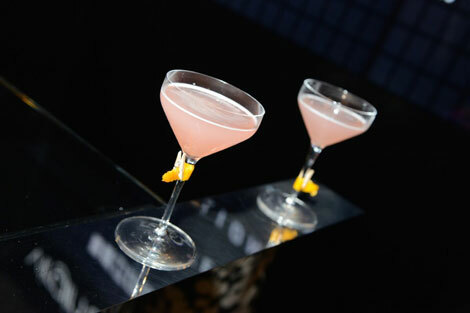 A wide range of cocktails on the drinks menu includes the signature Flying Lady (£11.8/US$18), which consists of Grey Goose L’Orange vodka, Limoncello, Regan’s Orange bitters, lime and cranberry juice. I ordered the Maiden Voyager (£9.8/US$15), a mix of rosemary-infused Beefeater gin, lemon juice, pineapple juice and soda. I don’t recall how many glasses I drank – it was a very easy-to-drink mixer! Food is also available at the bar, including small delights such as Brooklyn crab salad (£7.5/US$11.5), and sharing boards offering salt beef, pastrami, wallies, sauerkraut and crusty rye bread (£23/US$35). 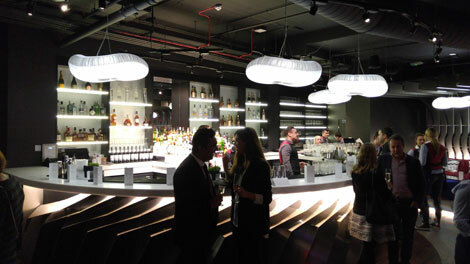 NY-LON Lounge Bar opens daily from noon to midnight.